The second act: “HE:Jam” series: HE:Digital will be introducing 3 tracks from Makoto & Danny Wheeler, Velocity, and Loz Contreas. It has become a compilation, which several artists got involved, and got supported by many DJ all over the world. We are ready to announce for its release. 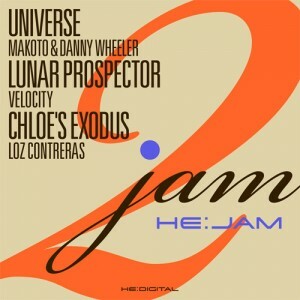 “Universe”, by the duo of Makoto from HE:Digital(Japan) and Danny Wheeler from W10 Records(UK). Swinging beats, impressive arpeggios, and underwater bass lines glimpse new futuristic sounds from Makoto and Danny Wheeler. “Lunar Prospector”, by Velocity. Smooth roller tune with heavy strings and organs. It is played by Bryan Gee and Random Movement,etc. Velocity just released his first EP “Concentration EP” from HE:Digital in 2011 which gave massive impression to the scene. This track is the new one from Velocity that we provide. “Chloe’s Exodus” by Loz Contreas from fresh UK Drum&Bass producer. Beauty intro with flowing melodies, turn out to be a heavy tune with fat beats and basses. Great track, as if recalling soulful vibe to the scene.